So we at Solar Heroes come across this question on a regular basis. The question is how much electricity does the customer use and what is the ideal size solar and battery system to make it fit just right? Well the answer to this is quite complicated. It is almost impossible to get the sizing just right. The electricity usage of customers is a fluid and constantly changing variable. We need to factor in seasonal differences based on certain appliance use that can be affected by the weather and other conditions. Also, the daily usage of customers is different depending on their activities for the day. The most common and easiest way we size battery and/or solar recommendations is by using the average daily use reading from the electricity bills of our customers. This is not very accurate. It is based on an average for the quarter and does not factor in the yearly seasonal changes. So, with this being said, we ask customers to provide us with a full year’s worth of electricity bills which is four bills, one for each quarter. (Click ‘make editable’ in Excel to view correctly and add figures). This is a very involved approach that requires the customer to audit each and every appliance and make note of the power rating. They then need to make a best guess on the number of hours of use for each appliance for both the evening and during the day. This method of having the customer audit their appliances can lead to many errors. This can be due to mistakes made in guessing their time for use and also errors reading the wattage or voltage of certain appliances. Another approach to getting the figures more accurate on the audit form is by using an electricity meter on each appliance. Some meters on the market will accurately record and store usage information on a 7-day cycle and will include max kW draw, volts, amps and much more. 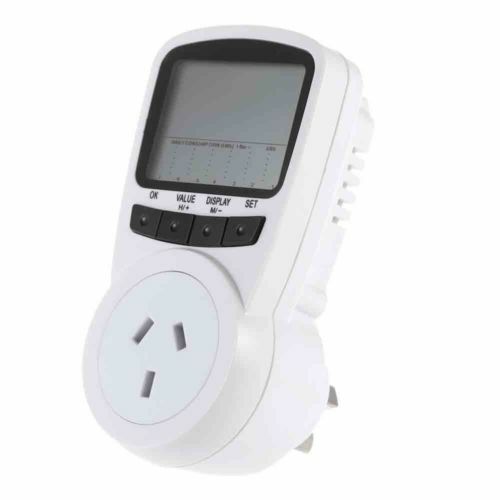 This meter will record this data and allows for the customer to get a very accurate understanding of each appliances electricity use. It can be quite shocking to see what some appliances are using. Some appliance’s appear to be very light electricity users but actually to turn out to be quite large. The same can be said for larger appliances, when in reality they can sometimes use the least. So, to answer the holy grail of questions as to how much electricity does one use? You can see this answer can be quite challenging. Once Solar Heroes feel that we have best guessed the usage behaviour of our customer, we then size the system starting with the quantity of solar needed. For explanation purposes, typically this is worked out by a factor of 4. So this means a 5kW solar system (20 x 250w panels) will generate 20kW of electricity on a 100% sunny day. Once we have designed the solar array, we then may need to consider storage sizing for the battery bank. Typically we work with the usable capacity of the battery not the overall capacity of the battery. This is very important as we need to make sure the batteries are not over taxed. Anyone wanting to know more can ask us, or simply research depth of discharge (DoD). So many of our customers who have dealt with previous companies have received very inadequate sized systems. As you can see based on the information above, we do our best to ask as many questions as possible in order to adequately design and size our customers systems. Any questions on this, please feel welcome to contact us.